This scenario has three parts, listed as Parts A, B, and C. Part A begins with some planning guidelines that mainly consist of planning an IP addressing scheme for a network. After you complete Part A, Part B of the scenario asks you to configure the three routers and one switch to implement the planned design. Finally, Part C asks you to examine router command output and answer questions about the details of current operation of the network. Part C also lists some questions related to the user interface and protocol specifications. 1. 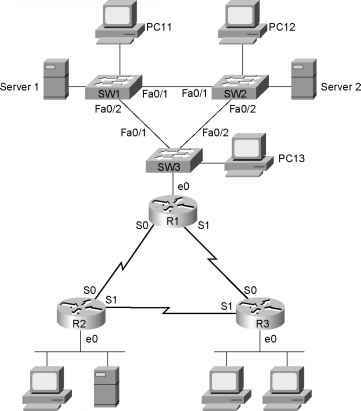 Plan the IP addressing and subnets used in this network. Class B network 163.1.0.0 has been assigned by the NIC. The maximum number of hosts per subnet is 100. 2. Assign IP addresses to the PCs as well. 3. Assign addresses for the switches near R1 for management purposes. Assume that a single VLAN is used on the switches near Router 1 (R1). Tables 16-1 and 16-2 are provided as a convenient place to record your IP subnets and IP addresses when performing the planning tasks for this scenario.